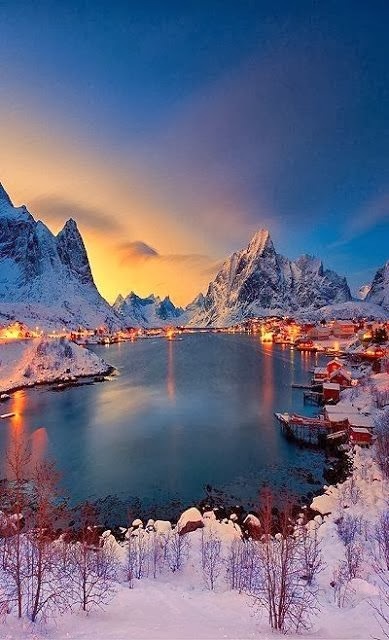 Reine is a fishing village and the administrative centre of the municipality of Moskenes in Nordland county, Norway. It is located on the island of Moskenesøya in the Lofoten archipelago, above the Arctic Circle, about 300 kilometres (190 mi) southwest of the town of Tromsø. The 0.33-square-kilometre (82-acre) village has a population (2011) of 329. The population density is 997 inhabitants per square kilometre (2,580 /sq mi). Reine Church is located here and it serves the northern part of the municipality. Reine has been a commercial centre since 1743. Today tourism is important, and despite of its remote location, thousands of people visit this village annually. The village is situated on a promontory just off the European route E10 highway, which passes through the village. Reine is located immediately to the south of Sakrisoya and Hamnøya.